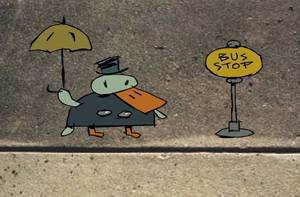 This is a very short animation created with a 2D animation programs called Toon Boom Studio. I was experimenting with animating my vector images over bitmap images--in this case a sidewalk closeup and a moon photo. I created it as a small (silent) clip for my current larger animation project (a whole 7 minutes! ), but I liked the little mini-adventure and added a soundtrack and sound effects. I used Apple's GarageBand for the music and scoured up the sound effects in my small collection for the SFX. This is no masterpiece, but I thought Duck might be welcome here on Drawger. By the way, Zimm made Duck's debut possible. He was kind enough to whip up a enough cyberspace to house this QuickTime.